Plants as sessile organisms are subjected to various forms of environmental stress. It is generally accepted that stress leads to excess concentrations of reactive oxygen species (ROS). 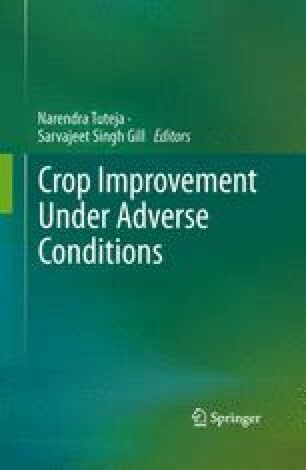 Crop yield and quality are negatively affected by stress leading to oxidative damage. Here in this chapter, we will discuss the participation of carbohydrates in plant stress responses. Soluble carbohydrates (e.g., trehalose, sucrose, raffinose, etc.) are recognized compatible solutes. Sugars can replace water under drought stress. As such, they keep membrane surfaces “hydrated” and prevent membrane fusion by maintaining the space between phospholipid molecules. Small soluble sugars (glucose, fructose, sucrose) can also act as signals. They are now recognized as pivotal integrating regulatory molecules that control gene expression related to plant metabolism, stress resistance, growth and development. Finally, as a new concept, we propose that soluble vacuolar carbohydrates (e.g., fructans) may participate in vacuolar antioxidant processes, intimately linked to the well-known cytosolic antioxidant processes under stress. All these insights might contribute to the development of superior, stress tolerant crops.